I had a nasty slip on the ice taking the garbage out before work at my day job ( as Entertainment Editor for “The Morning News with Dave Lee”, 5-9 am on WCCO Radio). I was walking back up the driveway my right leg slipped out from under me and my left foot, was dislocated, breaking both the tibia and the fibula right at the ankle. It felt like a compound fracture and when I looked at my foot after hitting the ground, it was dangling off to the side at a right angle. Tim's left ankle before surgery. Screaming ensued, at that point you think of all the things you wanted to do , clean the garage, move furniture for a sale, start the Nordic Track training again, things that you know are out the window for a while. I had my Cell with me so I called my wife, in bed sound asleep ( it was 4:45am), then I called 911. Some of my neighbors heard the screaming and they called 911 and came by to help. We had to salt the driveway so no one else would be hurt. I was there on the icy driveway for about 20 minutes waiting for the ambulance, it seemed like an hour. I like it when they say “which foot is it?”. That would be the one dangling off to the side, I believe! 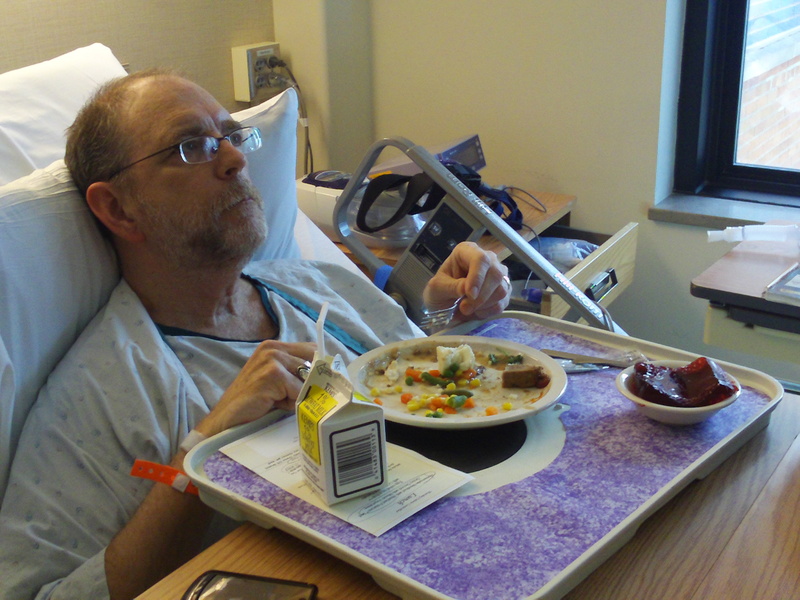 They loaded me up with morphine and took me to Park Nicollet Methodist Hospital. I cursed every one of those Minnesota potholes while calling the boys at WCCO to tell them I wasn’t going to be around for a while. My wife followed armed with a small Kodak Z16 HD pocket video camera to document the proceedings. The sight of my ankle in the ER is perfect for viewing at family gatherings at holidays… like HALLOWEEN! My first holding room was so small that the personnel kept bumping into my foot; it was a “Three Stooges” routine. After some X-Rays, they reset the dislocated foot. This is where in the old Western movies, they would say “Drink a swig of this and bite down on this leather” but today they have these things called drugs, I didn’t feel a thing. I couldn’t eat or drink before surgery, which finally happened at 8pm, it was 1 hour and 40 minutes long, took 8 screws and a plate and the orthopedic surgeon did a great job. Tim's ankle with all the new titanium. I stayed in the hospital until Thursday afternoon (2/12), resting; being poked and prodded, learning to handle the crutches and the bathroom. I needed some grab bars installed at home, so my wife arranged the installation for Friday morning. I moved to a transitional care unit near our house Thursday to have an extra day for Judy to get the house ready. Valentine’s day I went home to my new bed/office/media center. Judy cleared out the area rugs, had the bars installed, moved the furniture around and had everything just right. Luckily, I had a Valentine present sitting in the back seat of my car for a couple of weeks so I had some small way to thank Judy for all the hard work. I need to stay in bed until Monday (2/23) when the surgeon will open up the splint and wrap to check and hopefully remove the staples and sutures. She would then put a removable cast on and I’m on a non-weight bearing situation for another 4 weeks. She says it will be another 6 months or so before the ankle will be somewhat normal. The biggest loss in all of this is missing work for a couple of weeks. I so enjoy the camaraderie and good times on the morning show on WCCO, and the movie preview screenings 4 or 5 times a week. I hope to look into an ISDN installation for voice-overs and WCCO, but losing the chance to be on stage live with Garrison Keillor’s “A Prairie Home Companion” is particularly rough. Fortunately, PHC has a three-week break before a 3/21 show at the State Theater in Minneapolis and by that time I should be hobbling around with skill. I look forward to it. I broke both bones in my wrist last winter after falling on my icy driveway. When they tell you 6 months before you feel “somewhat normal”, believe it. Hang in there and be diligent with your therapy. You will reap the rewards of your hard work!! Hope to you are back with Garrison and the gang soon! 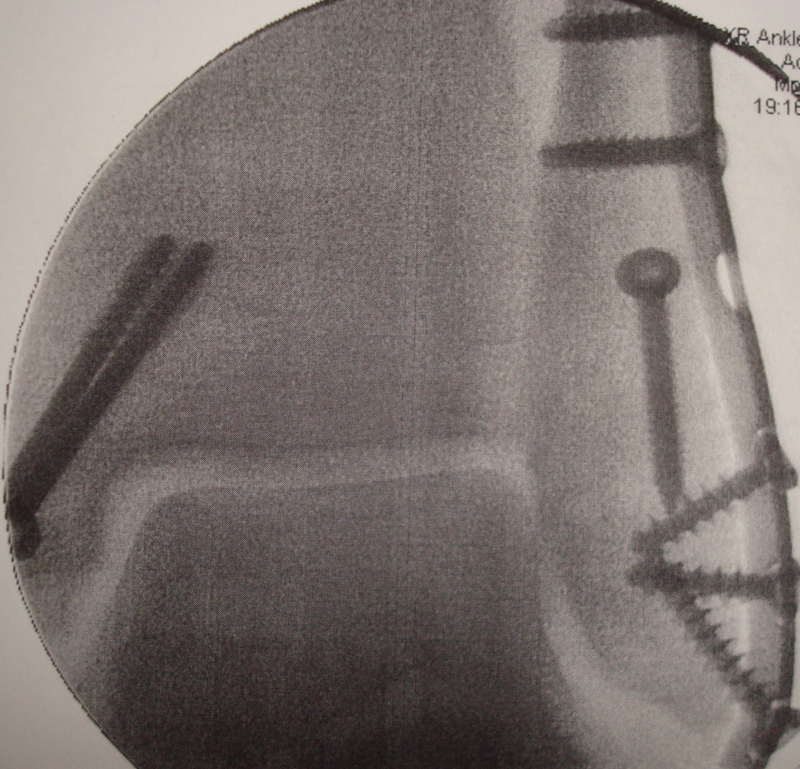 I broke an ankle in November (result: a plate and 7 screws), then broke my hip 11 days later (result: 3 screws). What did I learn? Don’t try hopping using the “good” leg only – always use a cane, crutches, a walker or a strong shoulder for support. My dancing career is over before it had a chance (although I was a lousy dancer before the accidents, so I guess it didn’t have much of a chance). Once you get both feet on the ground (literally), get all the physical therapy sessions allowable – it’s work and it’s pain but it’s also the only way to get back to where you were. It’s just takes much longer than youi hoped. I’m a faithful listener to WCCO radio. When I tuned in early Monday morning on February 9th, Dave Lee was just announcing that you were being checked out in the ER for a possible ankle fracture. I shared the news with my husband as we ate our breakfast, and felt so sorry for your terrible mishap. That very morning, at approximately 11:15am, I also took a spill at the end of our driveway as I was about to cross the street to our mailbox. It was my right ankle that was dangling and floppy…the best way to describe, along with what felt like an electrical charge up and down my leg and foot. No one in sight to come to my rescue, also no one home as my husband was shopping at Home Depot. The adrenaline set in and I was about to start my climb (aka dead man’s drag) followed by a step up, followed by another tackle with the front door, over the threshhold, through the foyer and kitchen, to the portable phone. I called my husband’s cell phone, which he had silenced…and left a horrible message for him. A call to a daughter followed, and she came to my rescue asap…and eventually we decided to call 911. 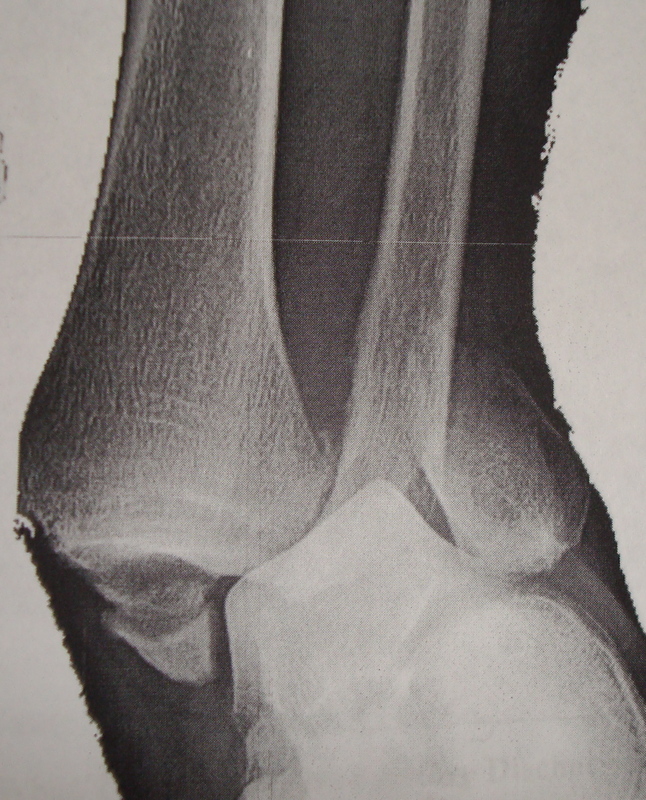 I was transported to Fairview Ridges Hospital with a diagnosis of right fibula ankle fracture. Surgery followed on Wednesday afternoon and I returned home late Friday afternoon with a plate and seven screws holding my ankle together, a walker and wheelchair, along with non-weight bearing instructions. I have a follow up appointment tomorrow with my surgeon. I can certainly relate to your pain and discomfort. Wishing both of us a speedy, healing process. You are in my prayers. A much belated thanks for your post. I’m so sorry about your break. I hope your recovery is moving along as well as mine. I’m limping still and swelling is an issue, I saw the surgeon today and she said it will be 6 months before i seem normal. Three months to go. I wish you the very best.